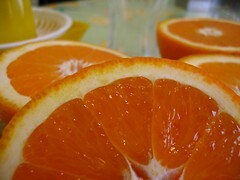 Image by WGyuri via FlickrI'm almost embarrassed to admit that I absolutely love orange gelatin. But my love for orange gelatin dessert has just reached a new high after I made my first recipe of Orange Jelly. This recipe is best made with Valencia oranges, which are known as juice oranges. They are available almost all year round, from February through October. So really, the best time to make Orange Jelly is during the summer months, when a cool, light and refreshing dessert makes for a pleasant end to a hot summer day. This recipe has got me wondering if the next dwarf fruit tree I buy should be a Valencia orange. Sprinkle gelatin over 1/2 cup cold water and let soften. Pour 1 3/4 cups boiling water over the gelatin and mix well to dissolve. Add the orange juice, sugar or sugar substitute and lemon juice. Pour into a 1-quart mold or individuals serving cups and chill until firm. Adapted from the The Fannie Farmer Cookbook. Pick up your own copy at BarnesandNoble.com. Selena, Is this to put on toast or english muffins, or do you eat it like jello?